COLUS seemed a little surprised to see us back so soon, although Amie seemed glad to see that I had returned quicker than expected. Everyone else at the base camp stopped what they were doing and looked at us as we closed the gate behind us. We were still breathless from running the entire length of the tunnel, and past the platform back to the camp. We recovered after a few seconds and THEROS stormed straight into a nonsensical rant. "Woah, woah, slow down, you're losing me... Have you found anything linked to HoN Co. close to the rigging or not...?" 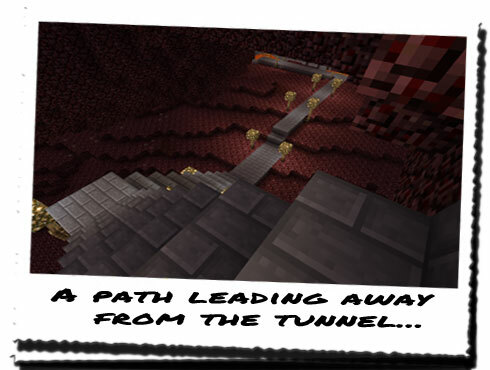 "We found more than expected... From where our platform was left, there is a stone road leading away and underneath a large rocky outcrop, forming a tunnel that leads to... Well, a dead end. Well, not quite a dead end; the tunnel just literally ends with a massive drop into a pool of lava below." "A road? How can you tell it was constructed by HoN Co. ...?" "Well, we noticed quite a few things that indicated that. Firstly, if the indigenous creatures here could build that type of thing, why aren't there more examples? Not only that, but we didn't encounter a single pig-man or floating ghost at all! No Creepers or undead either! It's like the Nether has been abandoned." Whilst THEROS caught his breath from speaking so quickly, I filled in with our possible theories as to why that might be the case. COLUS and the others seemed to initially accept the initial idea that something had driven them away, likely HoN Co., but they soon changed expressions when I introduced the idea that something might instead be luring them elsewhere. "That's not all... We only followed one of the paths which led through the tunnel and as I said, it led to a dead end. But it's what we could see off in the distance. I can only assume it's HoN Co. created as there is no sign of any other type of material it seems to be constructed from..."
"How do you mean? Non-Nether materials do you mean?" "Yes, like cobblestone or some smooth stone. It seems to be a massive circular construct sitting the centre of a massive lava lake, probably ten times bigger than the one at the obsidian plant..."
"Was there any sign of activity? Were there guards or scientists moving through it or nearby?" "Not that we could see... I didn't want to think this, but it looks to me like another obsidian plant..."
"What?!?! How can you tell? Is there obsidian production?" "Not from what I could see, but there are multiple lava falls being channelled directly into the construction itself, a central one and one on each corner..."
"We have to see this! Take a few supplies with you and we'll head off. I need to see this for myself! We all rushed to grab what meagre supplies we thought were sufficient; I took the blowpipe, diamond pick and a few bits of food. I didn't know how long we were going to take, and I didn't want to risk going under-prepared. OROTHO opted to remain with Joe at the base camp, to ensure there was someone to receive UOPETA if there was word back from SERVERE. The rest of us headed out towards the platform again, following the placed torch path back up to the hill. Reaching the hill, we allowed COLUS and the others to look around and assess the situation. COLUS went to the bottom of the hill and looked underneath where the other path led to, before coming back out and looking in the direction of the path we followed. "Right then... THEROS, you, me and THEXIS will head in the direction you initially went. You can show me what you found, and anything else that may have been missed. Meanwhile, Syeonyx, AMPHIS and Amie will go in the other direction. I wouldn't usually suggest this idea of splitting up, but we've not exactly got time on our side. If you find anything, document it and come find us." Nodding to COLUS, me, Amie and AMPHIS headed in the opposite direction, going underneath the hill, following the stone roadway and torches. It didn't go very far in before veering off to the left, and we soon found it twisted and turned it's way down, heading in the same direction as the other tunnel, only at a different elevation. "So what did you and THEROS see exactly? How do you know it belongs to HoN Co., and not someone or something else...?" I explained that we had seen a massive construction in the centre of a large lava lake, with five main lava channels falling through the main base and out of either edge... It was as though there was a use for that lava, otherwise it seemed pointless to utilise it in the construct at all... I had admit though that it was a brilliant marvel of technology and architecture; whoever had made that had to be proud of their work! Working with lava is incredibly dangerous, but to use it both practically and aesthetically within the design of a construction was genius! We came to the end of the tunnel, but realised that unlike the other tunnel, it didn't just end with a drop. 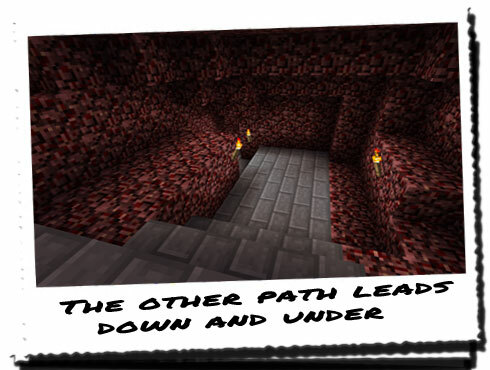 Instead the path continued down towards the Nether stone below, before leading off to the right in the direction of the construct. I began looking around elsewhere trying to find where the other tunnel ended; it must be close by as this path was visible from above. Continuing down the first few steps, I took a moment or two to determine of there were any guards or worse nearby, but being unable to see anything, I continued down to the first flat platform before the steps verged off to the right. Amie and AMPHIS followed me cautiously, possibly due to the unknown dangers that could be all around, and possibly due to the lack of a handrail or guard to hang onto. It was a little precarious, but provided you didn't look down, you were fine. I continued down to the bottom, whereupon I could now see the full construction before me, in the direction the roadway continued. I thought it would be a little dangerous to just stick to the road and be incredibly obvious to anyone who may be watching over the path, so I suggested that we head off to the right and see what we could make out from the darkness. Heading off the road, we took shelter in the shadows, away from the lights of the path, hoping to look for any signs of activity. "What in the world could HoN Co. need that for? It's massive! Surely it can't be another obsidian plant...?" "It would certainly make a lot more sense... Where better to find mass reservoirs of lava being left unused and freely available...?" "But what about the water needed for the conversion process...? Surely they don't bring in the water from Minecraftia into the Nether through a portal? If they did we'd see the pipes!" "That's true... 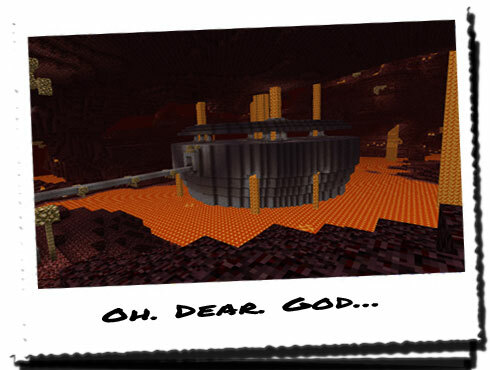 Unless they've found a source of water here in the Nether...?" "How could this dimension sustain any life then? Life needs water to survive!" "No, life in Minecraftia needs water to survive... This is entirely a new dimension where water might not even exist!" "That's a possibility I suppose... Maybe we can get close and take a look at the other side...?" "It looks like the only entrance is through the front there, where the path leads to... I can't see how else you could get in, because that rocky outcrop behind it is pretty far away..."
"Come on, let's try and find COLUS and the others. Maybe we can spot there dead-end from here." I led the way back onto the path, almost certain the tunnel COLUS and the others had taken was a little further along and way above us. It was likely that they had reached the end by now.